The struggle for a work-life and wedding planning balance is real y'all! Last week, I felt the stress on my body, my heart would pump faster at certain points of the day and I even ranted on snapchat (username: lilbitsofpau ... heaayy!). After working on my day off, I decided that things needed to change in my life, if not now then in baby steps. First step of my strategy was to not open my work laptop for a day, so on Fourth of July I didn't turn it on, I enjoyed the day with family and friends, watched the fireworks as if it were the first time in my life AND ate without restrictions (since I've been on wedding diet more). ...let's just say that the trench is not the only thing that is relaxed! I've been incorporating small things to choose to be more relaxed. It's a battle because a lot of things require my attention on a daily basis, but I need to make time to do things that make me happy, at least once a day. Dressing up, it makes me happy! Blogging and all of its aspects make me happy! So when people suggest putting pause on blogging to focus on all of the other things going on in my life, I immediately say no, because this right here, is my cup of tea. 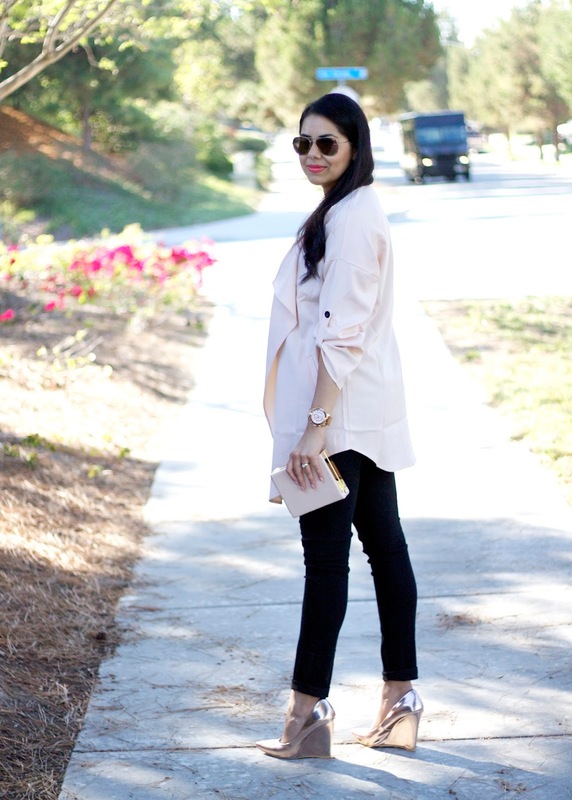 About the Outfit: SheIn Trench (here) | Black Tank Top | Black Skinny Jeans | Shoedazzle Heels (sold out but similar here) | F21 Sunglasses (sold out, but similar here) | Michael Kors 'Large' Runway watch | F21 Clutch (sold out but similar here) | MAC lipstick "Vegas Volt"
What a chic outfit! You look so gorgeous. Love that your glasses match your AMAZING shoes.